Brouwer’s Cafe in Seattle. Photo by Aubrey Laurence. Washington state has more than 200 breweries—second only to California—and new ones are opening regularly. 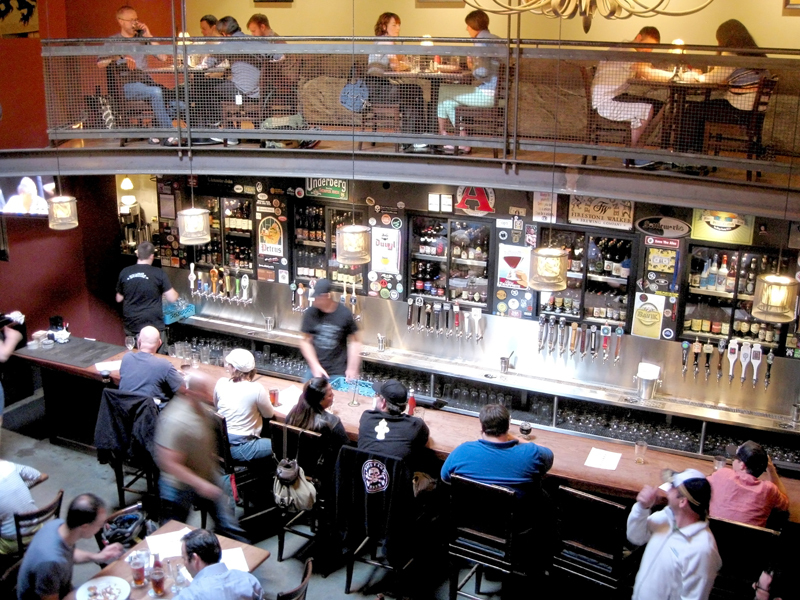 The state’s rich beer culture also extends to its world-renowned beer bars and beer stores, making a visit to the Evergreen State even more justified. After arriving at Sea-Tac Airport, rent a car and head north on I-5 for some fantastic beer destinations in Seattle and Bellingham. At its current rate of growth, the number of breweries in Seattle might one day overtake the number of coffee shops. Most are worth a visit, but due to Seattle’s heavy traffic, confusing one-way streets and limited parking, not to mention the Emerald City’s many lakes and waterways that make getting around difficult, it’s best to focus on one area of the city. And when it comes to areas with high concentrations of exceptional breweries and beer bars, the 2-mile stretch from Ballard to Fremont, on the north side of the city, is unbeatable. Here you will find a couple of world-class beer bars and more than a dozen breweries, many of which are only a couple of years old. In between Gas Works Park (2101 N. Northlake Way) and the Fremont Troll (3405 Troll Ave. N), visit the Fremont Brewing (3409 Woodland Park Ave. N.) indoor-outdoor Urban Beer Garden, which offers lots of seating and plenty of beers on tap, including cask-conditioned and barrel-aged offerings. Try the flavorful, balanced and highly sessionable UniversAle Pale Ale, which stands out among the myriad pale ales on the market today. Less than a half mile away from Fremont Brewing and across the street from Theo Chocolate Factory, make your way to Brouwer’s Café (400 N. 35th St.), which has 64 draft beers and a menu with more than 300 bottles. The bartenders and servers are friendly and extremely knowledgeable about beer. The replica of Manneken Pis (the famous peeing boy statue) and the wide selection of Belgian beers will make you feel like you’re in Brussels. If you’re in the mood for a Northwest-made hard cider, The Sixgill (3417 Evanston Ave. N), just one block away from Brouwer’s, offers a dozen ciders in bottles and on draft, plus a couple of dozen rotating beers on tap. Opened in 2012, Reuben’s Brews (1406 NW 53rd St.) is another nearby brewery to check out. The cozy taproom offers a slew of thoughtfully balanced beers. Unlike the many hop-forward brewers of the Pacific Northwest, Reuben’s pays great attention to malt bills, and many of its beers are brewed with rye, creating an additional layer of complexity. Of course, Reuben’s also pays attention to hops, and it proves it by making one of the finest double IPAs in the state (two, in fact, one with rye and one without), which features gentle malt flavors of caramel, bread and toffee, and a clean bitterness that leaves behind bright hop notes of citrus and pine. After fueling up on caffeine from one of the ubiquitous coffee shops, head to the booming beer city of Bellingham, which is 90 miles north of Seattle, 20 miles south of the U.S.-Canada border, and nestled between Bellingham Bay and the foothills of the North Cascades. This city of 82,000 has been ranked one of the highest cities in the nation for arts businesses per capita, and the local breweries represent that artistic spirit well. With five breweries clustered close together, it’s easy to see them all. Opened in 2008, Chuckanut Brewery & Kitchen (601 W. Holly St.) has already garnered too many awards to mention for its authentic lineup of European-style beers, and you would be hard-pressed to find better versions of its German-style lagers—even in Germany. Try the multi-award-winning Chuckanut Pilsner, which delivers rich and bready malt flavors complemented by a balanced hop bitterness that exudes delicate aromas of herbs and spices. In the heart of downtown, The Local Public House (1427 Railroad Ave.) features Menace Brewing Co. beers from nearby Ferndale, as well as about a dozen other rotating taps from local and regional breweries. Then, just a couple of blocks away, The Copper Hog (1327 N. State St.) is a comfortable and stylish gastropub with delicious food and 21 taps of craft beer. This spring, two new breweries opened in Bellingham. Aslan Brewing Co. (1330 N. Forest St.) produces some “dank” organic ales and lagers, and its restaurant serves everything from fish tacos to pulled-pork sliders, plus many vegetarian options. Try the refreshing Ginger Rye Ale. Meanwhile, at the Wander Brewing (1807 Dean Ave.) brew hall, get an intimate look at the beautiful 20-barrel brewhouse after choosing one of the well-made beers from 10 taps. Both breweries have barrel-aging programs in the works. In 2012, Kulshan Brewing Co. (2238 James St.) opened, and within a year it had to double the size of its brewhouse and triple its number of taps just to keep up with demand. Take a seat in the large taproom or outdoor beer garden, and grab a bite from one of the rotating food trucks that visit daily. Bellingham’s oldest brewery, Boundary Bay Brewery (1107 Railroad Ave.), has been a local institution since opening in 1995. Over the years it has garnered an unbelievable number of awards, and it has a fiercely loyal following for its delicious Northwest-style IPA. Even as breweries continue to open all around, demand for Boundary Bay beer continues to grow. Earlier this year it expanded its capacity by adding three 60-barrel fermentation tanks. After eating a hearty, hangover-quelling breakfast, such as the Cinnamon Roll French Toast with a side of homemade sausage at the HomeSkillet (521 Kentucky St.), do not even think of leaving town without stopping at Elizabeth Station (1400 W. Holly St.) for bottle purchases or to try a beer from one of the constantly changing taps. As you sip your beer, peruse one of the finest beer selections in the state. If you have time before your departure from Sea-Tac, swing by Redmond, a Seattle suburb that is just east of I-5, and make a stop at the popular Black Raven Brewing (14679 NE 95th St.). And if you need to make any last-minute beer purchases for your suitcase, Malt & Vine (16851 Redmond Way), a beer store and a tap house in downtown Redmond, has a friendly and knowledgeable staff and a wide selection of beers. On your flight home, when you realize that you have only scratched the surface of what this state has to offer, you’ll want to start planning your next visit. Check out the Hotel Bellwether (One Bellwether Way), which has picturesque views of the San Juan Islands across the bay. This hotel is within walking distance of most beer places in town. If you’re up for doing a 5-mile loop, you can hit all five breweries and multiple beer bars. Keep in mind, there are many taxi companies in Bellingham, and their rates are inexpensive. Did the Ballard tour a few times. Hit Reuben’s every time. Outstanding ! Populux and others within walking distance are all great. Heading for Hood River, OR for Christmas. Will get some Portland beers there!